OMEP Monthly MeetingOMEP Monthly MeetingAre you interested in a presentation from Helen May on Standing Up for Something Everyday, Advocacy, Agency in the Early Childhood Profession, click here for more. Just another reminder to continue to encourage your families to complete the Census if they have not already done so. There is another couple of weeks to get it done. There is a meeting for new Head Teachers being held on Thursday 22nd March 2018. Click here for the agenda. For those of you have haven’t seen her yet, keep an eye out, she will be around soon! It is so wonderful to see that we have had a recent influx of new graduate Teachers joining the Association - a very warm welcome to you all! We are aware that a number of you (our new Provisionally Certificated Teachers) were not able to/or missed out on the first Induction and Mentoring Seminar held in February. Therefore, to support you in getting started on your certification journey we have added an additional session on 3rd April (3.30pm – 4.45pm) to introduce you and your mentor to the Whānau Manaaki Kindergarten's Induction and Mentoring Programme/Kit. The session is being held at our Office in Porirua - please enrol on HR.Net. We look forward to seeing you there! 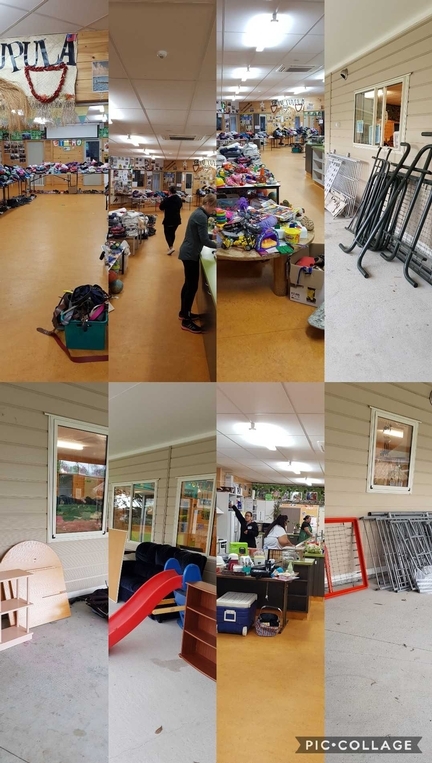 A huge thank you to all who donated household items and clothing for the Giveaway Day for our families held at Nuanua Kindergarten on Saturday. It was another hugely successful day and we had many appreciative families. Thanks also to the office staff and our teachers who gave up their time to help out. As our Mandy would say "you guys rock!" Storypark Introduction and Extension Opportunities! It’s been great to see so many teams come along to hear about the possibilities of using Storypark this term (the last introductory session for this term is in Kāpiti on 22nd March). In addition there has been a lot of interest in the Teachers Toolbox on Storypark since the introduction of this at the Regional Staff meeting this term. Don’t forget to keep a look out in your individual work email for the invitation to join this Teachers Toolbox! The positive feedback from teams who are finding that Storypark is effectively supporting their work around assessment as well as planning and administration is wonderful! Please let your ST know if you have found anything particularly useful so that we can share these examples with others. If your team is ready to join Storypark, please let me know so that I can organise your set up. Or if you are still considering it and have any questions please contact me at lynette.wray@wmkindergartens.org.nz. We also have Storypark Champions in each region who can support individual teams, so if you would like some additional support please get in touch with me or your ST.
For those teams who have already been using Storypark to write learning stories and connect with whānau we are more than happy to help you explore what else you can do on Storypark! Therefore, we have added a series of extension workshops throughout the region for the first week of the April term break; these are a hands on opportunity to explore the Planning feature in Storypark – check out the PLD calendar for more details! The Children’s Commissioner and the School Trustees Asosciation have published a series of six comprehensive reports on what matters to children and young people when it comes to education. Although the reports relate to learning in schools, many of the findings are relevant to early childhood education. Children and young people emphasised the importance of relationships, of teachers understanding their life and world outside and their place in their whānau. They said they could not begin learning unless they had a trusting relationship with their teacher. “getting my parents involved with my learning." Children and yong people asked for their names to be pronounced correctly and their language and culture to be valued, and they wanted to feel safe to explore their culture. The full six reports are available here. Early childhood teacher Chloe Lundie-Hodge was one of three women who presented a petition to Equal Employment Opportunities Commissioner Dr Jackie Blue on International Women’s Day. The “Treat Her Right” petition was signed by 8,500 New Zealanders and is in support of equal pay. An equal pay case is to be lodged for early childhood teachers later this year. Initially it is expected to focus on teachers not in kindergarten, who often get a flat $21.50 per hour, regardless of experience. This is what services have to attest to paying qualified teachers in order to get funding. Advocates for early childood education often argue for investing in early childoood to save money later in life, on prisons for example. This week, Whānau Manaaki Kindergartens wrote to the Corrections Minister Kelvin Davis and the Justice Minister Andrew Little urging them not to build a new 3,000 bed prison and to instead spend the money in more productive areas. New Zealand is the the top ten countries for imprisonment in the OECD, and our rate of imprisonment is significantly higher than that of Australia, and more than twice the rate of the United Kingdom. More than half of our prison population is Māori. In the letter, we stressed that most prisoners have children and the effect on the 20,000 children with a parent in jail is significant, in terms of health, educational outcomes and likelihood of themselves ending up in jail. Did you know that your cell phone will charge much faster if you turn it on to Airplane mode while charging?